The assault on the Death Star at the end of Star Wars: A New Hope is one of the great moments of cinema, a pure thrill ride as the Rebel Alliance push their attack and a plucky band of pilots destroy the biggest weapon ever created. It's a lovely story, but is it the truth? Obviously on one hand, of course it's not the truth: Star Wars is the fictional construction of George Lucas. But on the other hand, it's not the truth either. How can it be when the destruction of the Death Star was an inside job? It's easy to joke about how plasma rockets don't melt space station cores, but the truth of the matter is that plasma rockets don't melt space station cores. What do I mean by this? 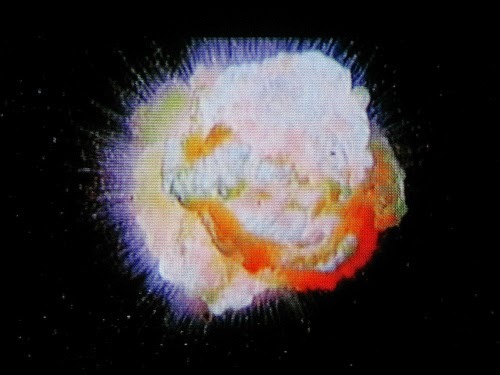 The destruction of the Death Star is very clean. In an instant the entire structure explodes, atomising it completely with barely a scrap of metal left. It is possible that a missile in the reactor core could have released that much energy, but unlikely. In Return of the Jedi, we see Luke fighting Vader on the Death Star II. Luke's lightsaber, one of the most powerful weapons in the galaxy, repeatedly hits a metal bar. This metal conspicuously refuses to melt or shear in half. If the metal that the Death Star is made from is so robust, how the heck could a mere missile have caused an explosion big enough to literally disintegrate a mass the size of a planet made from this wonder-metal? Is it not more likely that special explosives were planted throughout the Death Star, to enable an even distribution of destruction and ensure its destruction? Note also the method in which the Rebels attack the Death Star. They fly horizontally along the surface towards the vent, but do not drop bombs. Instead they fire missiles from the front of their craft. For a successful missile strike, it would need to somehow turn 90 degrees in mid-air, a feat that is clearly impossible (as if they had guided missiles they would not have needed to get so close and it would have been impossible to miss). In Return of the Jedi it requires much larger attack cruisers to fly directly to the core of the space station to destroy it! No, the Rebel attack was simply a very handy scapegoat with which the Empire could blame the destruction of the Death Star on. But why did they want to destroy it at all? We have already seen the evidence throughout A New Hope. The Death Star was a health and safety nightmare. Throughout the film we witness Stormtroopers falling helplessly to their deaths due to the lack of any railings. The insurance premiums must have been a nightmare alone, but the lack of proper safety rails would have spelled the death-knell for any upcoming health and safety inspections. Remember, the station had just become operational, it was inevitable that an inspection would take place at any moment. Could Vader's worry about intruders be due to the fact he believed Obi-Wan to be an undercover inspector making an unannounced visit? The Death Star being shut down for health and safety reasons would have been disastrous, and the amount of railings needed to make such a structure safe would have been cost-prohibitive. It would make far more sense to destroy the Death Star in a so-called 'terrorist attack' and then claim the money back in the insurance to start again. This is what happens, and we see the results with the Death Star II, which has a lot more safety rails inside it. However even these rails are not enough as the elderly emperor tumbles over them to his death. Could this be George Lucas's brilliant critique of modern health and safety culture? Or does it go deeper than that, expertly lampooning those who mock important health and safety, only to then tumble down their own unprotected bottomless pits?